Policy theories have generated widespread knowledge of the policy process, but the field is vast and uncoordinated, and too many scholars write and speak with so much jargon that ideas become obfuscated, hardly understandable to other scholars, and beyond the interests of people outside of academia. As scholars, we often assume, rather than demonstrate, that our ideas convincingly make sense to people beyond our narrow academic circles and that policy process research contains insights that add cumulative and comparable knowledge to practice and the field. Yet, if we do not take the time to check if we understand the state of the art, and can share a common understanding with a broad set of peers, how can we state that we are accumulating useful knowledge collectively rather than producing work of limited utility and relevance beyond our own narrow individual concerns? We can also ask the broad community of public policy researchers: is there genuinely a cohesive and advancing field of policy theories or are we each producing our own theories and assuming they are useful to others? We need to ask these searching questions more often, and keep them at the forefront of academic debate. Existing thematic reviews only provide limited assurance about a coherent research agenda across the field of public policy research. We need more work from theory-specific experts to explain their theories and empirical knowledge clearly enough to help others gauge progress and compare it to progress among other approaches. To do so, we need to replace the jargon with more accessible language to see if it still makes sense. If we succeed, we can proceed with confidence. If not, we should ask ourselves uncomfortable questions about the state of our field or, at least, key approaches. Click here to view the special issue full table of contents, the whole issue is free to access until 31 May 2018. These eight articles demonstrate that he judgement of a theoretical contribution should shift and expand, from just the need to provide new empirical material based on systematic data collection and analysis, to the value of demonstrating novel ways to think about the usefulness of our approaches and why we should think a particular way about them. The latter is too easy to dismiss as a review essay, in which we have heard the arguments before. Yet, all of the approaches in public policy can be explored from different perspectives, and no scholar can claim with confidence that they can understand the breadth of these different perspectives with sufficient depth. 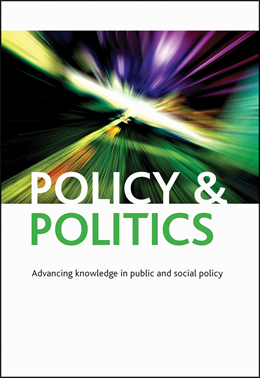 Consequently, the special issue in Policy & Politics offers a set of articles each focused on synthesizing some of the contributions and what we have learned from eight commonly used approaches in our field. The ‘Scottish approach’ to policy and policymaking: what issues are territorial and what are universal? Pathologies of policy learning: what are they and how do they contribute to policy failure?